A pregnant woman, I’ll call her Dorie, was concerned about the effect that her asthma medication might have on her unborn baby. Dorie decided that the safest thing to do was to stop taking her asthma medication until the baby was born. Unfortunately, without her medication, Dorie experienced an acute asthma attack – both she and her unborn baby died. Another pregnant woman, Melissa, received the chickenpox vaccine on Monday and discovered that she was pregnant on Thursday. Melissa knew that if a woman gets actual chickenpox during her pregnancy it could damage her unborn baby. Even though she wanted a baby, Melissa was afraid of having a handicapped child. She decided to have an abortion. These are some of the tragic stories I’ve heard in the past from pregnant women. What makes them really tragic is that neither the asthma medications that Dorie was using, nor the chickenpox vaccine that Melissa received, cause harm to unborn babies. Both are much safer than the conditions they treat. Dorie’s story illustrates the fact that many women have diseases and conditions that need to be treated during pregnancy. The disease can be more dangerous than the drug used to treat it. Examples of conditions that need to be treated during pregnancy include depression, high blood pressure, lupus, infections, diabetes, etc, etc. There are many. Conditions for which women can stop taking medicine for the duration of the pregnancy and restart once the baby is born include acne, high cholesterol, and many (but not all) preventative vaccines. What are the risks of your condition to a pregnancy? 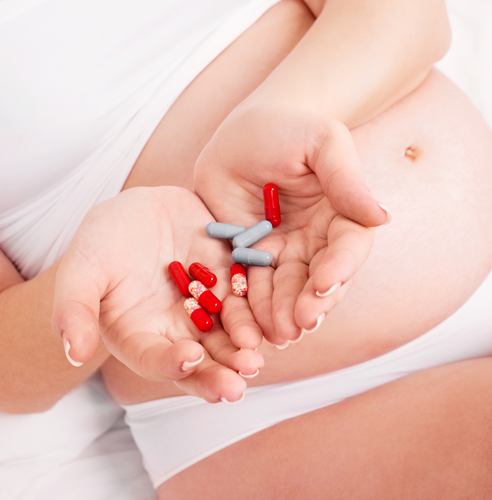 What medications should you continue to take during pregnancy? What medications should you stop taking during pregnancy? What medications should be changed to ones that are safer during pregnancy? If the pregnancy is a surprise (like about 50% of pregnancies that occur in the US each year), one of the first things you want to do is to call your health care provider to have this discussion. The baby is most vulnerable to the effects of medication within the first eight weeks – the time when you may not even know you are pregnant. But don’t panic! While more research is needed, overall, very few medications or vaccines have been shown to cause birth defects. And for those medications that might be dangerous, there are usually perfectly good alternative drugs that can be taken instead.